The mural is off to a great start…well, to be honest, it’s almost already done. 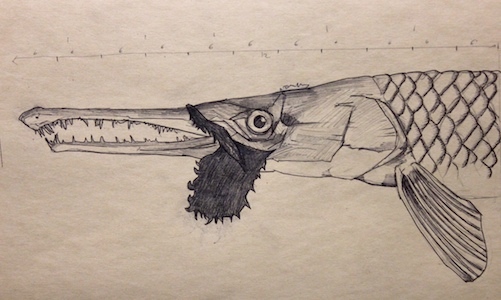 The patrons of Dangerous Man Brewing Co. chose a gar to be the subject. To which I say, “thank you citizens.” When the word was official I immediately got started on some gar sketches, and put my materials together for a Monday-mural session. 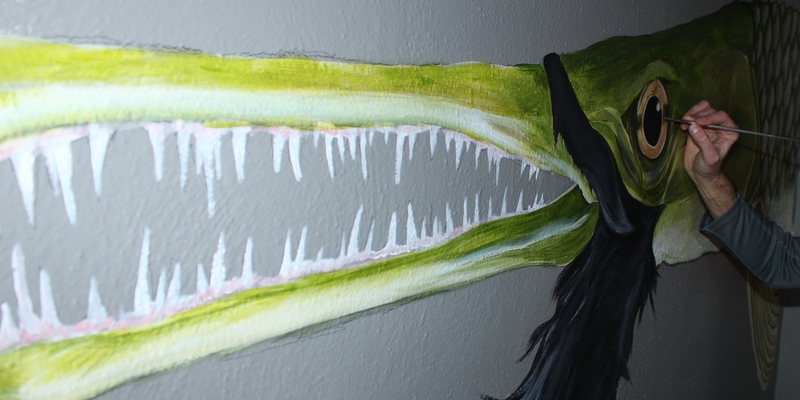 The image came fast and I decided right away that I would keep this mural simple…just a shortnose gar with a beard. No fuss. Along with touching base with the crew at DM, I also shot an email off to Twin Cities Live about the plans. During the Lucidchrome mural, they expressed interest in doing story on the brewery-fish-murals once I had scheduled the work with the third brewery. They got back right away and we set a date to do a shoot and interview this Thursday. I’ll post a link here once the story airs. With all the pieces in place, sketches made, and materials chosen I headed to DM this morning through slushy streets. I arrived a bit after 9:30am and got to work right away. Coming in to work on a mural of a bearded gar seemed like a completely logical thing to do there. The vibe was right. This vibe, along with a smooth wall, and perfect colors to play off of, helped speed this first day along. I was organized, focused and the juju was flowing. I had to stop at about 2:30pm, simply because I wanted to keep some work for Thursday when we do the TV spot and allow myself to sleep on the mural for a day or two before I said, “done”. I voted for a sturgeon, but I have to say the Gar looks awesome! I can’t wait to check that out at Dangerous Man, looking good! NICE! I can’t wait to get up there and check it out while tasting whatever they have on tap.